Are you craving for something sweet and delicious? Or interested in Filipino desserts? Dessert is the last part of the course meal, and certainly the best part more so when we are talking about Philippine desserts. Filipino desserts are delicious and sweet, just like its people. Yes! You read it right, majority of Pinoys are generally sweet natured and happy, so it’s no longer surprising why even in the midst of crisis Filipinos always come out of any difficulties smiling. You see, Pinoys find solace in food, especially the Filipino desserts that come in different presentations, colors, and sizes. The Pinoy desserts usually served in the last part of every meal, for merienda or snacks and in between lunch and dinner. There are also pinoys that eat desserts anytime of the day to satisfy their sweet cravings and just to enjoy life small things. If you are wondering about what are the best Filipino desserts that you can try at home then you are in the right page as this article contains the best Filipino desserts recipes. The following are easy desserts to make, Filipino dessert recipes with pictures. 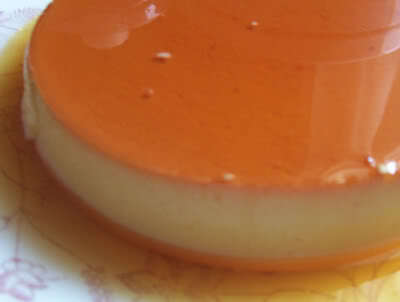 Leche flan is the Pinoy version of crème caramel, a rich custard cake dessert with oozing caramel on top. Leche Flan is one of the easy to cook Filipino desserts and considered by many as the best desserts ever made because of its taste and melt in your mouth texture. This quick easy dessert requires a llanera, an oval shaped baking pan, and steamer. In case you don’t have a steamer, you can cook leche flan in your rice cooker or regular pots with cover and tray to place the llanera. 1. 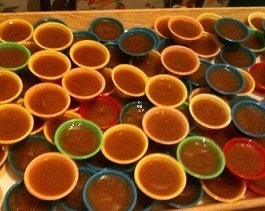 The first thing to do when making leche flan is to prepare the sweet topping made of brown sugar. In a medium saucepan, dissolve the 1-cup brown sugar in ¼ cup water and let it thicken. 2. Stir continuously until the desired thickness. 3. Once desired thickness achieve, pour some of the sugar mixture in your llanera evenly, so if you have 4 or 5 baking pan coat each one with a generous amount of the mixture. 1. Preheat the oven, about 350 degrees Fahrenheit. 2. In a medium sized mixing bowl, combine the rest of the ingredients (milk, egg, and vanilla) then mix well. 3. Pour the mixture into the llanera evenly. 5. Place the baking pan in the oven and bake for at least 30 minutes. 6. Check if the dessert is ready by poking a knife or toothpick into the dessert. If the toothpick or knife comes out clean, then the flan is ready. 7. Take the llanera and let it cool for 5 minutes before placing the dessert in the refrigerator to cool. 8. Before serving, turn the llanera upside down to dislodge the flan into the desert plate. Ps: I cook my leche plan in the rice cooker, easier to do than in the oven. You can put 2 small sized llanera into a medium sized rice cooker. 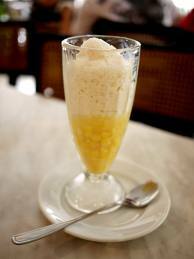 Philippine is a tropical country and the ruthless heat make halo halo an all time favorite. Halo halo a local dessert is also great for snacks or merienda during the summer season since this dessert help Pinoys keep cool. The word halo means mix as the dessert is a mix of shaved ice, milk, sugar and varied sweetened fruits such as garbanzos, beans, sweet potato, banana, corn, silky coconut, mung bean, sugar palm fruit and jackfruit. 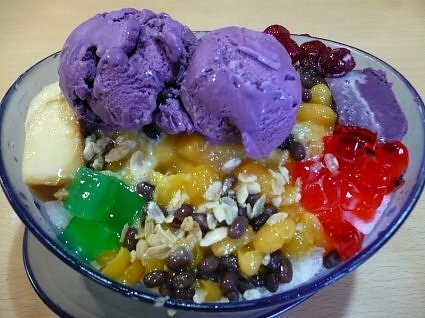 Halo halo is also great with tapioca pearls and gelatin. The dessert usually served in large bowls or tall glasses. 1. Combine the sweetened ingredients in a tall glass or large bowl. 4. Topped with leche flan, ube halaya, young rice, and ice cream (optional) then serve immediately. This is another excellent and heat quencher dessert. 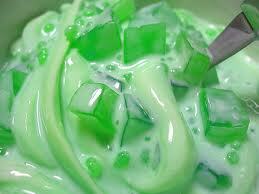 Buko Pandan is made from fresh and young coconut and gelatin. The dessert is often mistaken for buko salad a favorite birthday food because of the similarity in dairy ingredients and texture. The difference between the two is that Buko pandan contains the sweet aroma of the pandan and green gelatin, not seen in buko salad. By the way, traditional cooking dictates you boil the pandan leaves first to extract the juice before adding the gelatin bars. However, many Pinoys nowadays uses the ready to made Gulaman to save time. Combine water and the powdered gelatin, and then stir with a spoon. Add the flavoring then stir until evenly distributed. Heat a medium sized saucepan then pour-in the mixture. Let it boil while continuously stirring. Turn off the heat then transfer mixture to a mold. Let it cool (room temperature). The texture of the mixture must be firm once cooled. Mix the condensed milk, cream, buko and tapioca pearls. Let the texture thicken by chilling in the refrigerator for a few hours. Next, combine the gelatin with the sweetened mixture made of condensed milk, young buko, cream, and tapioca. This dessert makes use of sweet young coconut or more popularly known in the Philippines as Buko. The shredded coconut mixed with fruits is a staple in every occasion from birthday parties to town fiesta Pinoy serve the sweet dessert. Check out my post on Filipino Birthday Party Food Ideas to know more about fruit salad. 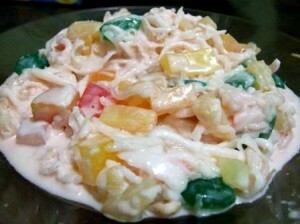 Buko salad is very similar to fruit salad, the difference is that the former main ingredient is the young coconut milk. In a large mixing bowl, combine the buko, nata de coco, kaong, pineapple chunks, and fruit cocktail then stir to mix the ingredients well. Next, add sweetened condensed milk and all-purpose cream then mix thoroughly. 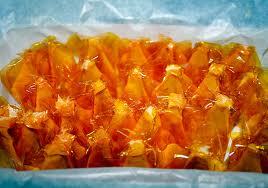 Yema is a sweet dairy candy. This dessert is love by many pinoys as yema simply melts in your mouth. Plus! It is easy to prepare like the other Filipino desserts. By the way, this sweet dessert is influence by Spaniards and readily available in small stores or tindahan. 4. Next, add the peanuts then stir until mixture becomes thicker. Take note, the desired thickness usually takes about 15 to 20 minutes to achieve. (Adjust heat from medium to low heat when desired texture is about to be achieve. 6. Scoop a spoonful of the mixture then rolls using your hands to form a ball or your desired shape. 7. Cover using a cellophane and serve. Pastillas de leche is a no cooking and heating dessert and great to eat anytime of the day. By the way, authentic pastillas recipe require fresh carabao milk and cooking, while the best pastillas are from Laguna, San Miguel, and Bulacan. The recipe below is the simplest version as I just use powdered milk instead of fresh milk. 1. In large a mixing bowl, pour the condensed milk. 2. 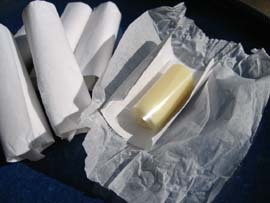 Fold-in gradually the milk until the texture of the mixture similar to the dough and all powdered milk completely mixed. 3. Get a spoonful of the mixture and put into the molder or cylinders. 4. 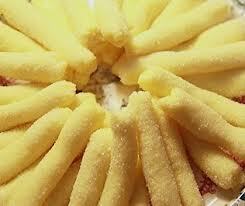 Once molded, roll pastillas on granulated sugar. 5. Wrap in cellophane or colored paper. 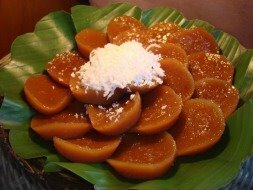 A lot of Filipinos considered kutsinta the top dessert since the chewy and unique taste of the sticky brown dessert brings comfort. It is a delicious dessert and merienda, no doubt about it, and a must try if you are on a Filipino food trip. I have lots of memories eating kutsinta since my family really enjoyed eating the kakanin, and because my brother in-law main business is producing and selling special puto and kutsinta. If you want to try cooking this Filipino dessert, know that time consuming preparation is worth the trouble. In a large mixing bowl, combine all the rice flour, all-purpose flour, and brown sugar then mix thoroughly all the ingredients. 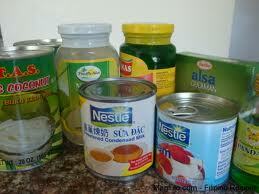 While mixing, gradually add water then continue mixing until all ingredients completely distributed. Next, add the lye water and anatto water (soak anatto seed in water about 3 tbsp) then continue mixing. Steam for 40 minutes to an hour, once cooked let it cool for 5 minutes. Serve with grated coconut on top. Mais con hielo is the easiest dessert as you just mix all the ingredients and viola, a Filipino dessert worth trying anytime you are in the Philippines or prepare in your home. 1. Mix shaved ice, milk, and sugar. 3. Place them on a glass, then mix and enjoy! 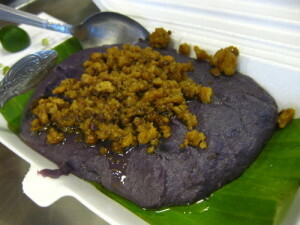 Ube Halaya is a Filipino dessert that is made from grated purple yam locally known as Ube. If you are wondering about how to make ube halaya, below are the ingredients and procedure to follow. 1. In medium sized cooking pot melt the butter over low heat. 2. Next, add the condensed milk and stir well. 3. 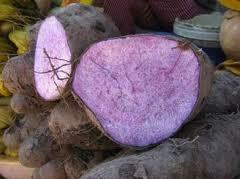 Add the purple yam then just stir. 4. Add the vanilla extracts and occasionally stir until the texture is thick, about 15 to 20 minutes under low fire to thicken. 5. Pour the prepared mixture into container then let it cool (room temperature). Bukayo is Lingayen native delicacy. This Filipino dessert is made of coconut strips loaded with sugar. 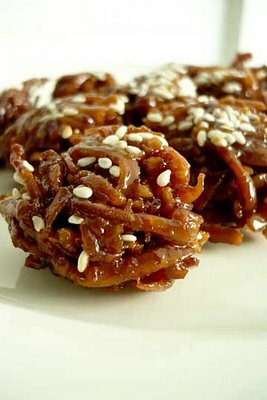 It is really sweet, chewy, and great to eat after meal. 1. Grate the coconut meat then set aside. 2. In a large wok, add oil then cook coconut strips until it turns slightly brown then set aside. 3. Boil the 1-cup coconut water and brown sugar until heavily reduced into the desired thickness. 5. Return the wok with coconut strips back into the stove then turn the heat to medium high heat. 6. Pour the syrup (sugar) and dissolved cornstarch then let it cook until even more thicker or the mixture take a firm shape. 7. Remove the wok from the heat then shape a spoonful of the mixture to a wax paper, then let it harden.